Is urbanism the key to a sustainable future? The pair of aerials demonstrates the transformation of a conventional strip shopping center into a mixed-use, pedestrian-friendly town center that will serve the surrounding suburban communities. The existing big boxes and drive-through restaurants are embedded in fine-grain fabric of urban blocks, centered on a new square. Recently, another tier of work has evolved that offers a more explicit range of advanced environmental tools. Operating within the urban-to-rural transect, these projects have generated a menu of measures that address energy and water conservation, as well as coding techniques for successful implementation. In the spirit of this pursuit of sustainability and acknowledging the current economic, social and environmental challenges, the office has been pursuing several initiatives, among which sprawl repair perhaps stands out as one of the most urgent, and is the subject of our new publication, The Sprawl Repair Manual. 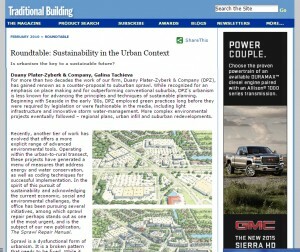 ← Roundtable: Sustainability in the Urban Context – Is urbanism the key to a sustainable future?